(CNN) -- India's foreign minister has cautioned his Australian counterpart that the relations between the two countries could be strained unless Australia tackles the continuing attacks on Indian students studying there. S.M. Krishna expressed his concerns during a phone call with Australian Foreign Minister Stephen Smith on Monday, an Indian government statement said. Krishna "recalled that Australian leaders had, time and again, reassured India that the Australian authorities were treating the incidents of assaults with utmost seriousness. However, the incidents seem to be continuing," the statement said. "He emphasized to the Australian foreign minister that non-redressal of this vital issue will cast a shadow on our otherwise excellent bilateral relations, and urged that the Australian government should immediately ensure that the concerned state police authorities deal with ongoing investigations with sensitivity and a sense of urgency." The Indian government has already issued a travel advisory for its college students studying in Australia. That advisory went out after a 21-year-old student was stabbed to death in Melbourne as he walked from a train station through a public park on January 2. There have been several other incidents in the past year. 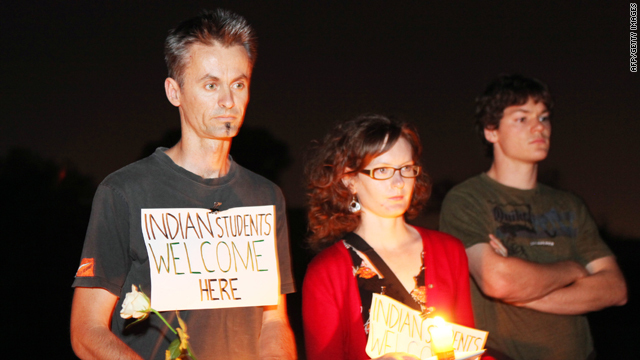 During a one-month period over the summer, at least 10 Indian students were attacked. The most severe case left an Indian student in a coma; another student was stabbed in the stomach. More than a dozen arrests were made. Australia authorities said at the time that they didn't think the attacks and robberies were racially motivated but were instead crimes of opportunity against soft targets: students who typically travel alone at night on public transportation. Hundreds of Indian students saw it differently, calling the attacks racially motivated. Earlier this month, Deputy Prime Minister Julia Gillard dismissed the notion that Australia is a unsafe for international students. "Australia is a very safe country. By world standards, we have a very low homicide rate," Gillard said. "In big cities around the world, we do see acts of violence from time to time; that happens in Melbourne, it happens in Mumbai, it happens in New York, it happens in London."